blinds, velux, fly screens, awnings, window blinds.vertical, roller, venetian, wood venetian, pleated, perfect fit and much more. Keywords: Blinds Velux Fly Screens Awnings Window Blinds.vertical Roller Venetian Wood Pleated Perfect Fit and much More. 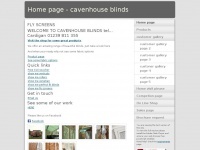 A profile of Cavenhouse.co.uk was found on the social network Facebook. The web server with the IP-address 93.184.220.23 used by Cavenhouse.co.uk is run by EdgeCast Networks and is located in USA. There are many websites run by this web server. The operator uses this server for many hosting clients. In total there are at least 2,635 websites on this server. The language of these websites is mostly english. A Nginx server hosts the websites of Cavenhouse.co.uk. XHTML 1.0 Transitional is used as markup language on the webpages. The website does not specify details about the inclusion of its content in search engines. For this reason the content will be included by search engines.